The CHM relies on the generosity of its friends and supporters to serve to more than 110,000 participants each year. From planetarium shows to living history, concerts to workshops, the CHM serves school children, adults and families. Invest in the wonder of learning by giving to the Culture & Heritage Museums. Your gift supports programs that reveal the wonders of the Carolina Piedmont’s natural resources, the wonder of history as shared at Historic Brattonsville, the wonder of imagination through programs designed for our youngest learners, and the wonder of the sky revealed at our Settlemyre Planetarium. Wonder is an amazing thing, please give here today. For ideas on ways to support the museums, please take a look at our Gift Catalog. There you may find just the right thing that resonates with your interests. For other ideas and information, feel free to contact us at connect@chmuseums.org and 803-909-7242. You may check out membership benefits and join here. To purchase a membership for someone else, go here. There are unlimited creative and flexible methods to give to the Culture & Heritage Museums. If CHM is a passion of yours, please consider exploring the various methods for giving, including combining philanthropy with your financial planning. If you would like more information about bequests, life income plans, charitable lead trusts, or other planned gifts, as well as programs and areas your planned gift can support, please contact our Development Department at 803-909-7419. 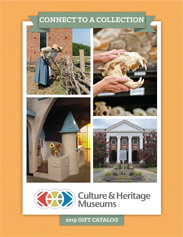 Culture & Heritage Museums is a family of museums in York County, SC, operated by the Culture and Heritage Commission and partially funded by York County and private donations.